April 4, 2014 by Ken Ward Jr.
Interviewer: I’m always interested when I talk to people who have reached the very top of their fields what they wanted to do when they were young. You were growing up in a not rich family with a single mother in a West Virginia town. Did you ever dream of being a titan of industry? What did you want to do? Blankenship: I think I wanted to be a professional baseball player at the time. It can only imagine the kind of pressure a CEO and the chairman of a huge company is under. And if I try to put myself in your shoes or in the shoes of a CEO, I can sort of imagine that if i have a fiduciary responsibility to a board and shareholders to make sure the profits are as good as they can be, then I’m sort of sympathetic to the idea that, look I’m not forcing my workers to work here, I’m not forcing anyone to do anything. We all use energy, we all use coal. Providing America with cheap and affordable coal is my job. That’s my responsibility. Maybe there are corners that have to be cut. Is that a trade off that happens? You’re an interesting guy, so it’s interesting to get your thoughts on these political things. It seems pretty obvious to me that so much of this YouTube video is fiction that the definition just doesn’t apply. Then there’s the notion of what part of reality it is trying to depict, not to mention whether it provides much to accurately maintain a historical record. But beyond that, it seems a little insulting to the good people who work hard to make real documentaries to lump this in with their films. Do we really think that this recycling of Blankenship’s discredited arguments about the Upper Big Branch Mine Disaster belongs in the same category as something like Hollow, the Appalachian interactive documentary that just won a Peabody Award? Seriously now. You’re going to give us a former Massey board member pontificating about the disaster, and identify him as if he were just any old mining engineer? By now, if you’re following this issue at all, we know that some of the individuals interviewed for the video have said they either didn’t understand Blankenship’s involvement in funding the project or allege they were specifically misled about his role. And of course, we’ve seen the somewhat bizarre situation in which Sen. Joe Manchin, D-W.Va., is complaining he didn’t know about Blankenship’s role and demanding that the video be removed from the Internet and not distributed. You have to wonder how this possibly could have happened. And most importantly, some of Sen. Manchin’s comments included in the video were a bit odd. For example, when the interviewer in the video is pitching Blankenship’s view that a massive inundation of natural gas was what caused the explosion, Sen. Manchin responds, “I never heard that. I always assumed that it was methane.” What? To be sure, the Blankenship-Massey “Act of God” theory about a natural gas inundation got plenty of attention from the media (see here and here, for example). It’s hard to believe Sen. Manchin had never heard of it or wasn’t briefed on that controversy. Surely Sen. Manchin read MSHA’s report on the disaster, and it discusses this issue extensively. One of the more maddening things about the media coverage of all of this is the apparent inability of so many journalists to provide a little more detail about the major issue underlying the theory of the disaster that Blankenship is trying to push. Remember that four separate investigations — the federal government, the state government, the United Mine Workers, and the independent team led by Davitt McAteer — concluded that a small methane ignition in a poorly maintained and inadequately rock-dusted mine fueled a gigantic coal-dust explosion that killed 29 miners. A central spot where Blankenship’s view diverges is that he — along with other former Massey officials and company lawyers — have argued that there was an unforeseen inundation of natural gas into the mine from a crack in the mine floor. This natural gas was the explosion’s only fuel, Blankenship argues, and coal dust wasn’t an issue. This notion of an unpredicted inundation of explosive gas is important, because obviously if it couldn’t have been predicted, there perhaps was nothing Blankenship could have done to prevent the explosion and resulting deaths. But a year ago, Blankenship changed his story a bit. All of a sudden, he was arguing that there were things that could be done — by the government — to prevent this sort of disaster. We broke the story long ago about how there had been previous methane outbursts at the Upper Big Branch Mine prior to the 2010 explosion. And we’ve reported on how the U.S. Mine Safety and Health Administration’s own investigation concluded that exactly this sort of methane leak likely was part of what began the chain of events that killed those 29 miners. And we revealed how MSHA blocked questions by independent investigator Davitt McAteer’s team about what federal officials did — and didn’t do — to follow-up on the previous methane incidents at Upper Big Branch. The problem, of course, is that neither MSHA nor Massey followed up on these earlier incidents. Blankenship hasn’t fully explained why Massey didn’t act — and unfortunately, the media folks who were part of his New York media tour this week didn’t bother to ask him about the issue. If Blankenship was as concerned about miner safety as he professed in interview after interview this week, then why didn’t he shut down Upper Big Branch years ago, until the company figured out what to do about the methane releases it had experienced time and again? Also not really addressed by the media is any real discussion of the issues about the coal dust buildup, and whether, absent the settlement Alpha Natural Resources worked out with the government, MSHA would have done a better job of proving its case about inadequate rock-dusting at UBB than it did years before in a civil case over the 2001 disaster at the Jim Walter No. 5 Mine in Brookwood, Ala. We’ve seen already problems with MSHA’s lack of tough enforcement could become a problem for U.S. Attorney Booth Goodwin when future criminal cases unfold from Goodwin’s Massey investigation (see here and here), and the agency’s inability to make its case on rock-dusting at Brookwood was inexcusable, given what was at stake. It only serves to give Blankenship ammunition now in the wake of Upper Big Branch. These things are too far out in the weeds for the national media’s so-often superficial coverage of coal country. 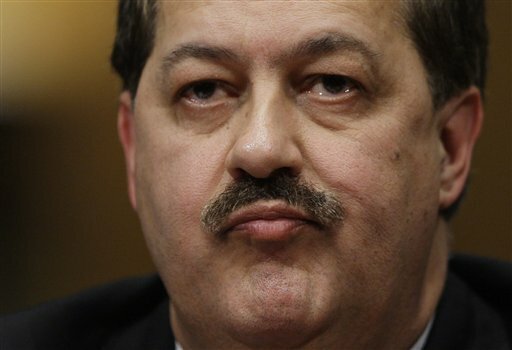 This week’s Blankenship interviews work for the national media. Truth be told, they love the guy, because he fits so well into their stereotypical idea of what every coal executive must be like. So instead of grieving together, the families of the miners who died had to spend their week doing their best — without a big budget and a PR firm behind them — to respond somehow to Blankenship’s video. Where was the national media coverage of 41-year-old Timothy W. Memmer, who was killed last week at a coal mine in Indiana? Did anyone do a national story about MSHA’s report outlining the absolutely preventable death of Markel J. Koon in the collapse of a CONSOL Energy slurry embankment? Anyone put out a piece about a new Department of Labor Inspector General’s Report that found MSHA still doesn’t know how often mine operators falsify accident and injury data to avoid tougher enforcement? Where were all the other local media when the state Board of Coal Mine Safety and Health was weakening its proposed rule for proximity devices that would have saved the lives of miners like Steven O’Dell? The final thought that comes to mind after this week is how many of these national media outlets would have bothered to make note of the 4th anniversary of the Upper Big Branch, had not some PR firm been serving them up Blankenship to help fill airtime in the talk shows that they try to call news programming? It reminds me of what one of the family members who gathered outside the federal courthouse this week to protest the Blankenship video was saying: Blankenship gets to go on with his life — in this case by a nice tour of TV studios in Manhattan. Here in West Virginia, 29 families get to go to the cemetery again this weekend. What does it matter to the people interviewed if Blankenship was involved or not? Would their opinions and views have changed? If they were telling the truth it should not matter who was paying for the video. Why are they upset? The thing that has puzzled me all anong with Blankenship’s theory is what he thinks is the difference between “natural gas” and “methane”. Natural gas is mostly made of methane, mixed with other gasses. Is he saying that there are two different things in a mine, methane and natural gas? There is a difference in purity between methane emitted from the mine, which is essentially pure methane, and natural gas, which contains ethane and other gases up to 5-10%. But Ken is right–if Massey thought lowering the amount of air was dangerous, why did they continue to run coal, if not because of the high price of met coal at the time? It’s a moral question. Blankenship’s documentary is a marvel of hypocrisy on the point. As for the post-accident dust samples, whether they were compliant or not is a moot point. The legal standard for compliance at the time was 65% total incombustible content in intakes. NIOSH had already shown how the dust standard was too low, and MSHA did not issue a rule until after the accident. The UBB miners never had a chance. I’m not saying that Massey isn’t responsible. Ultimately the choice to mine in conditions they considered unsafe was theirs alone. But it is tragic that it takes a disaster to get MSHA to act, when they already know that action is needed. There’s a moral component to that failure as well, but it is ultimately an operator’s responsibility to place it’s miners’ safety above other considerations. The purpose of this little piece of cinema is, to me at least, clear: “reasonable doubt.” The best time to work on this is not at trial, though plainly that’s a necessary time. No, the best time is pre-indictment, when the prosecutor is sifting through the many, many pieces of evidence, and trying to make a very difficult decision — can I convict this guy? There is now one year left in the five-year federal criminal statute of limitations (there is no statute of limitations on felonies in W Va). Booth Goodwin, the US Attorney for the Southern District of WV is the first target audience for this video. He has to look at this film and realize it’s going to be played and played and played and played, right up to the date of Blankenships indictment. And even more times thereafter unless the judge in the case enters a gag order. Goodwin knows the evidence in this case better than anybody, and he is facing the biggest decision of his life. But he might draw a lesson from Blankenship’s other famous court decision, the US Supreme Court’s decision in the case involving disqualification of Brent Benjamin in a Massey case because of Blankenships funneling $3 million of spending on behalf of Benjamin’s campaign. There the SC was criticized for some because they didn’t articulate a very clear test of when political contributions to judicial campaigns crossed the line enough to require disqualification. All the court said was that, wherever that line was drawn, spending $3 mm in a $6 mm campaign total surely crossed it. Maybe that’s what Booth Goodwin needs to decide: there may be a fine line between a civil violation of safety regs, and a criminal violation. But wherever that line is drawn, and however vaguely it is defined, the reckless indifference at UBB crossed it. 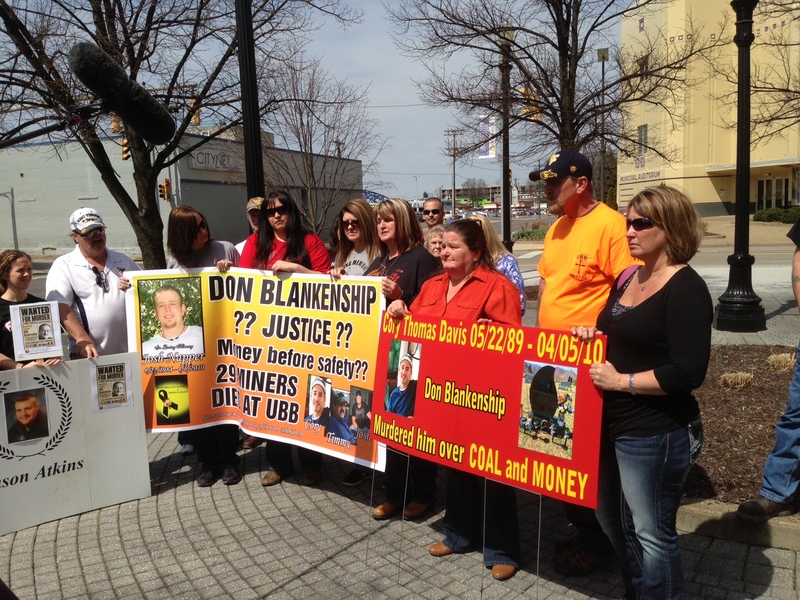 And regardless of the ultimate verdict, the 29 miners who died on April 5 four years ago are entitled to their day in the U S District Court to present their case for negligent homocide. Or as it is sometimes called, in short hand, murder. Thank you Ken for your critique of the Blankenship Show and, especially, the media that are sucking it up. All of us who care about these issues, not to mention the future of our democracy, are so fortunate to have your reporting and your example of what real journalism is. I hope they are teaching you in journalism courses (if such thing still exists) to the next generation. Thanks for your detailed coverage and discussion of the anniversary. I too was struck by the total absence of mention in “Upper Big Branch: Never Again” of any of the previous inundations. It would seem that those occurrences contradict the out-of-the-blue, act-of-god storyline presented.